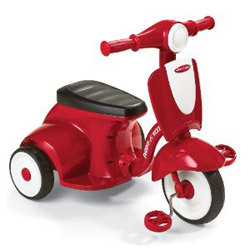 The Radio Flyer Classic Lights and Sounds is a beautifully designed plastic/metal tricycle with flashing blinkers, music and horn. Features also a storage space and great rubber tires – very nice vehicle! 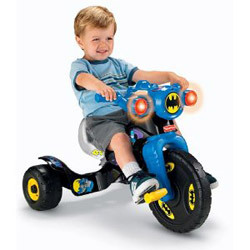 The DC Super Friends Batman Trike is a solidly built plastic tricycle equipped with flashing lights and a sound system, also features a 3-position adjustable seat. Durable trike for a nice price. 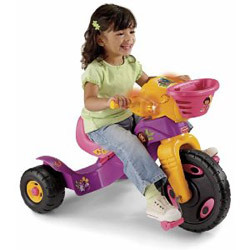 The Fisher-Price Dora the Explorer is a good-class plastic tricycle equipped with flashing lights and a sound system, also features a 3-position adjustable seat. 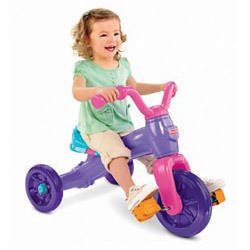 Durable trike for a nice price.